This is probably the 3D model I'm currently proudest of. 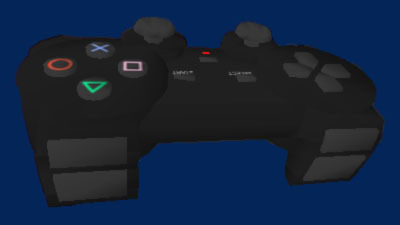 The actual content is pretty mundane, but this model of a PS2 Controller I modelled and textured in Lightwave 6 actually made it into the shipping version of Escape From Monkey Island PS2 for the controller menu. The moment of triumph was this conversation with Chris Miles, lead artist on the project. Chris: [walks into my office and sees model on my screen] "Dude, who modeled that for you? I don't remember assigning that to anybody"
Chris: [laughs heartily] "... No really, who modeled it?" Chris: [pauses] "... Really? wow that's pretty good." it actually used to have the exact logo on the controller in the middle there, but I had to take it out since we discovered having it there was against the Sony TRC requirements at the time. oh well.